Todays biker requires classic styling, high performance, and rugged durability for their bike and their motorcycle boots. Chippewa delivers with their Men's 27911 Bomber Buckle Motorcycle Brown Boots. With comfortable and protective features designed to make you e ... (see full details) (see specifications) #CHP27911. Todays biker requires classic styling, high performance, and rugged durability for their bike and their motorcycle boots. Chippewa delivers with their Men's 27911 Bomber Buckle Motorcycle Brown Boots. With comfortable and protective features designed to make you easy on your feet, these Chippewa boots are made to ride. Handcrafted in the good old US of A, these 11-inch men's boots feature brown bomber jacket leather uppers for instant comfort and the long-lasting durability you need on the road. The buckles, which is non-tarnishable hardware, shine like your bike and gives this pair some added style. Chippewa employs Goodyear leather Welt construction to attach the Vibram nitrile/cork yellow plug outsoles, increasing longevity and making them fully repairable. When you're wearing the USA-made boots, you'll have solid footing on a variety of terrain because the rugged soles is oil- and slip-resistant. They help absorb shock, as well maximize energy return for less fatigue. For additional support, there are triple-ribbed steel shanks for reinforcement in your arches and 4 iron rubber midsoles to give you even more stability from below. Leather vamp lines the insides of this pair of brown boots and helps wick away moisture and perspiration from your feet to keep you dry and cool, mile after mile. The removable TEXON insoles work in combination with the lining for moisture control and is anti-microbial to prevent any sort of foreign concoction from growing in your leather boots. Go the extra mile and ride in style (sounds like a slogan!) with Chippewa Men's 27911 Brown Bomber Buckle Motorcycle American-Made Boots. Pick up yours today from Working Person's Store for all the comfort and performance features you require on the open road. Ok, disclaimer, I bought these for fashion reasons solely. I do not ride motorcycles so I can't tell you how they hold up to riding. In any event, words can barely describe how much I love these boots. Just like Taos, my previous boot purchases were all Frye's. Silly, silly me. I doubt you can find a better looking, handcrafted in America engineer boot for the price. They do fit true to size I suppose, but I added a insole just to make it nice and snug. A lot lighter than I expected and the leather is oh, so soft. 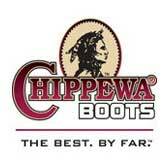 It sounds crazy, but after one purchase, I'm buying Chippewa's for the rest of my life. It is very hard to find superior brown engineer boots and when I happened upon these then found out they were Chippewa, I was ecstatic. I have trusted Chippewa boots for a long time because I believe they are a great manufacturer of boots and these boots solidified that. They are very fashionable in my opinion and useful when I decide to go for a ride on my Harley. For the price you can not beat these boots. I just received these today and am really impressed with the comfort. I have fat feet and ordered 12EE. My normal size would be 11EE but I wanted to ensure enough room. I wish I had chosen 11.5EE, but I don't plan on hiking with them. Much better then the Harley boots I've tried on which are way too stiff. The leather was soft and pliable right out of the box and they really look great! The price from here was phenomenal. want to buy some Frye's cheap? Brown is a nice change from the standard Black. These boots are advertized with a removable insole, which they do not have ,The only thing i would like in them is a cushioned insole,other than that they are a very nice boot. Chippewa Boots: Men's USA-Made 27911 Brown Bomber Motorcycle Buckle Boots is being added to your cart.